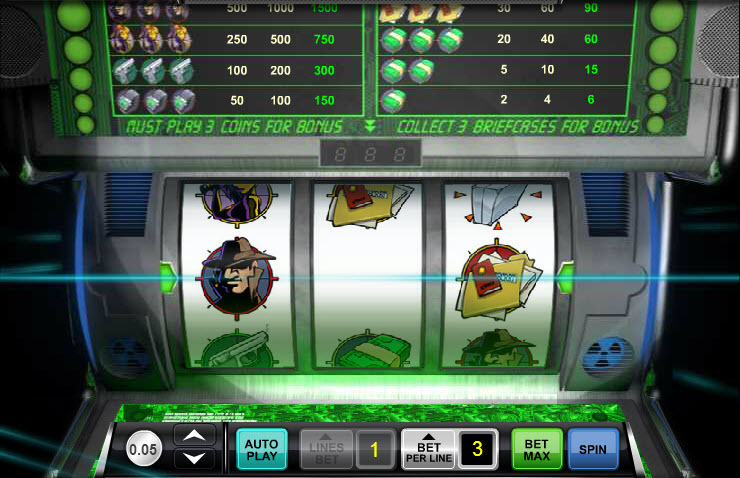 Overview: Conspiracy Slot is a 3-reel, 1-line slot machine with a classic spy thriller motif. Grab the guns, girls and gear needed to successfully complete your mission: winning as big of a prize as possible. The maximum bet is 3 credits, with coin values ranging from 0.05 to 5.0. Play with the max possible bet for a chance to enter the bonus round, which will only be infiltrated by collecting three briefcases on the 3rd reel of the pay line. These briefcases can be accumulated one-by-one throughout the duration of the game. Once in the bonus round, simply click on a desired briefcase and collect the corresponding amount of credits. Keep picking briefcases - even the same one more than once - until the one dynamite-filled briefcase is picked, which will bring an end to the bonus round. If you can string together a few such picks you'll be well on your way to making sure your jackpot is neither shaken nor stirred, but just plain big. Similar Slots: If you like Conspiracy Slot, you might like these other slot machines from Ace Gaming: Deal or Steal, Freak Show, Free Spin Saloon, Fruit Fuzion, King's Castle.